Ovation's Quarterly Business Travel, Financial Services Firm Travel and Law Firm Travel Indexes contain three years of data findings, listed quarterly with accompanying historic analysis dating back to 2009. Financial services firms travel a little bit differently than the general business travel segment, especially in class of service. Ovation Corporate Travel, the 5th largest travel management agency in the U.S. by volume, according to Business Travel News, has published its Quarterly Business Travel, Financial Services Firm Travel and Law Firm Travel Indexes. The indexes contain three years of data findings, listed quarterly with accompanying historic analysis dating back to 2009. Visit https://www.ovationtravel.com/lp-3q2017-business-travel-indexes to download Ovation's Q3 2017 Business Travel Indexes. Ovation utilizes this high-level analysis to identify trends and to benchmark individual client activity against a ‘yardstick’ representing over $230 million in annual air and hotel spend. The data serves as a resource in determining opportunities for strengthening clients’ travel programs in such areas as travel policy adjustment, service enhancements and supplier negotiations. 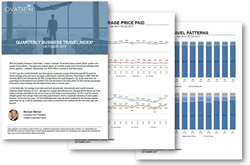 “These Indexes are showing us that financial services firms travel a little bit differently than the general business travel segment, especially in class of service,” noted Executive Vice President, Michael Steiner about the Q3 2017 Business Travel Indexes. “Across all three Indexes, the average airline ticket prices paid, both domestically and internationally, have been more or less steady for the past few quarters. But if you look at the Financial Services Firm Business Travel Index and compare that to our cross-industry Business Travel Index and Law Firm Business Travel Index what you’ll see is that financial services firms have been flying about 25% more Business Class and First Class than the other two Indexes. While they fly differently, with respect to hotel bookings, the average hotel room rates paid both domestically and internationally are pretty comparable across all three Indexes." Ovation services over 700 clients, including over 250 financial services firm clients and over 200 law firms through its law firm-focused subsidiary, Lawyers Travel; data for these indexes was culled from a cross-industry-sample of clients within each of these areas. To download Ovation's Q3 2017 Business Travel Indexes visit https://www.ovationtravel.com/lp-3q2017-business-travel-indexes.